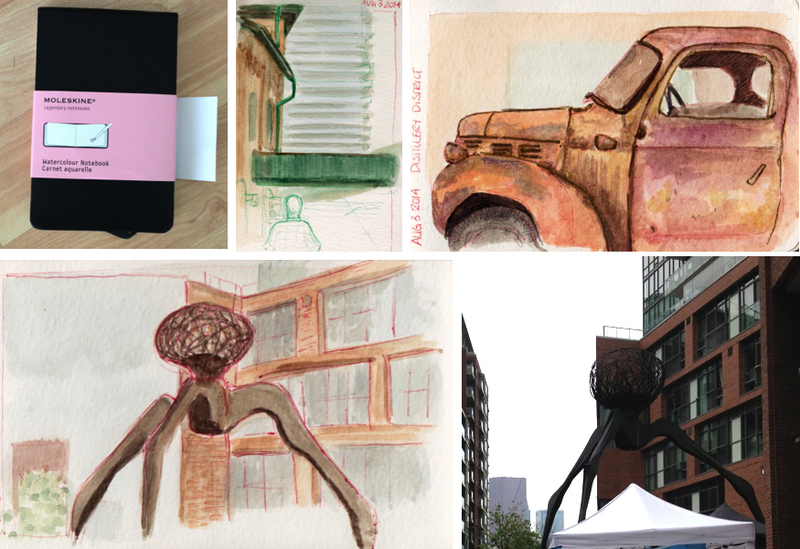 The Toronto Urban Sketchers group went to the Distillery District last weekend to sketch the scenery and I decided to bring along my new Molestkine Watercolour Notebook to test it out. I've seen so many great sketches using the proper kind of paper for watercolour that I had to try it. It's always a bit nerve racking to start using new mediums but I really want to explore the various possibilities with watercolours. Since it's a small sketchbook I had time to make three quick sketches. They are not the most accurate but it was fun to play with colours a little more. The paper takes the water very well so I'll be able to practice wet on wet watercolour techniques in the future. Now it's just a question of getting familiar with it and hopefully see significant improvements by the end of this sketchbook.